Subclavian steal syndrome is a rare condition causing syncope or neurological deficits when the blood supply to the affected arm is increased through exercise. 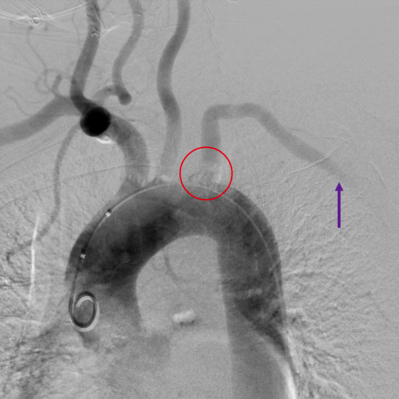 Subclavian steal is secondary to a proximal stenosing lesion or occlusion in the subclavian artery, typically on the left. In order to compensate for the increased oxygen demand in the arm, blood is drawn from the collateral circulation, which results in reversed blood flow in the ipsilateral vertebral artery (or less commonly the internal thoracic artery). The syndrome comprises of both cerebral and upper limb clinical features, however cerebral features are often rarer due to the collateral supply form the contralateral vertebral artery. Coronary-Subclavian Steal Syndrome occurs in patients who have undergone an Internal Mammary Artery (IMA) Graft. An increase in oxygen demand in the left arm then steals blood from the IMA leading to cardiac ischaemia. The condition is twice as prevalent in males and occurs three times more often on the left side compared to the right*. *Interestingly, 1 out of every 50 people have their vertebral artery arising directly from the aortic arch, thereby avoiding any chance of the syndrome developing. Due to the offending lesion tending to be an atherosclerosis, the main risk factors for the condition are increasing age, hyperlipidaemia, hypertension, smoking, and diabetes mellitus. Some patients will present with arm claudication due to the occluding lesions, such as arm pain or paraesthesia, made worse with arm movement. Reduced blood supply via the vertebral artery can result in a wide range of cerebral symptoms, including vertigo, diplopia, dysphagia, dysarthria, visual loss, or syncope. Suspected cases should initially be investigated with duplex US scan, which can show the retrograde flow in the affected vertebral artery during exercise. Routine chest radiograph can aid in assessing for any external compression on the subclavian artery causing the syndrome. All patients should be started on anti-platelet and statin therapy, if suitable. Patients should have any modifiable cardiovascular risk factors addressed, such as smoking cessation, weight loss, and optimising diabetic control. 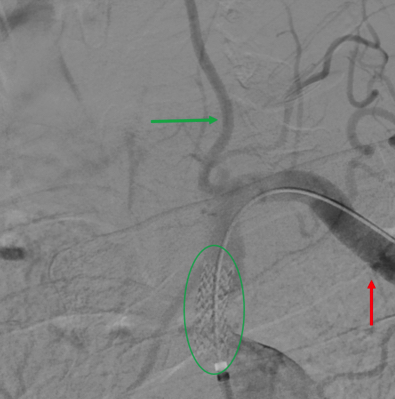 Occlusions may be treated either through endovascular or bypass techniques. In cases with neurological symptoms, cerebral flow re-establishment must be prioritised over direct treatment of the subclavian stenosis. Use of percutaneous angioplasty ± stenting (Fig. 3) has reported success rates upwards of 90%, albeit with higher rate of restenosis with worsening disease severity. Use of bypass should be considered for longer or distal occlusions. Options include carotid-subclavian bypass (5 year patency rates reported at 80%) or axillo-axillary bypass. 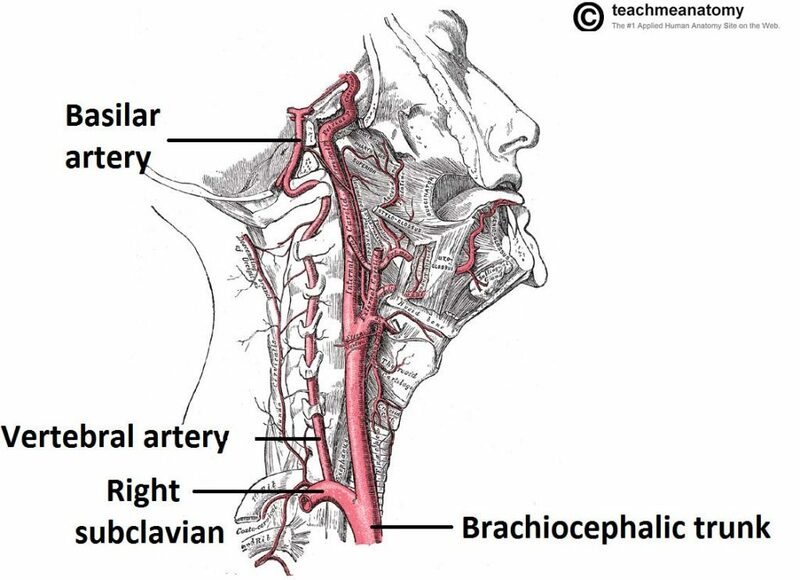 From which artery does the right subclavian artery branch from? Which of the following is NOT a risk factor for developing subclavian steal syndrome? Which of the following is the best in definitively assessing patients for subclavian steal syndrome?